These 3 Concentric Circles represent a great way to look at your organization’s TALENT and how it might be most effectively used. 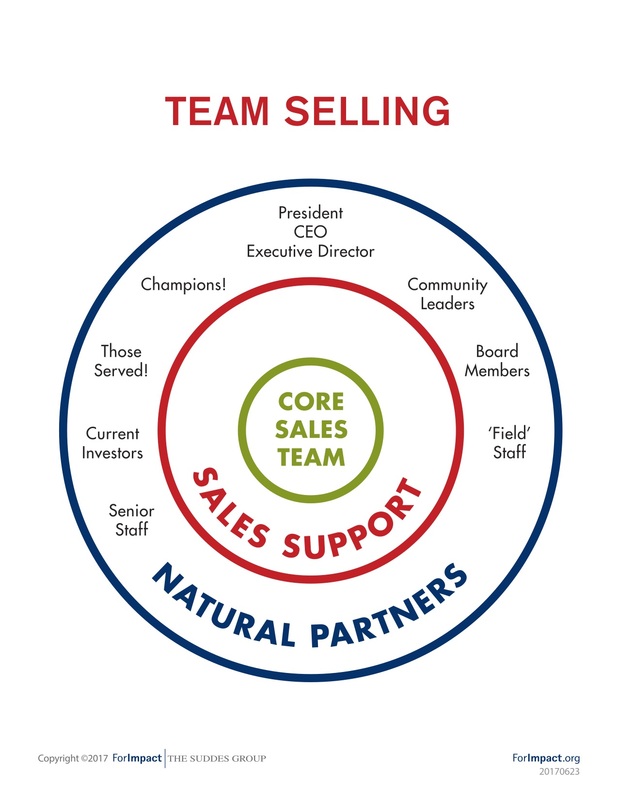 The Blue-Red-Green Team is a great visual that helps with roles and responsibilities within the Sales Process. Use your ‘Blue’ Team to help with predisposition, opening doors, and even setting up or requesting the visit. Your Blue Team represents best example of ‘3 Degrees of Separation’ (Kevin Bacon is actually less than 3 moves (2.78) from any other actor). Note: In many cases, you are only 1 person removed from who you want to see. This is especially true in Ireland and North Dakota. Blue Team can be engaged before the visit or after the visit. Blue Team can be on the visit but never leading the visit. There can only be one leader and it must be a Green Team member. Blue Team never goes alone/solo on a visit! We don’t do ‘peer-to-peer’ solicitation which is just ‘trading dollars’. So, there is always a professional staff person engaged on visit. Green Team is always the R.M. (Relationship Manager). No exceptions to this. Red Team can help with setting up visits, especially with phone follow-up and call backs. This visual provided a real eureka moment for a College Sales Team: Deans can help get the visit, but the Deans don’t have to be on every visit. And they (as the Green Team) don’t have to set up every visit themselves. Note: This framework works for a Business Sales Team as well. Share it with your Board as a nugget they might find helpful.